Dr. N C Gupta is a popular Orthopedist in Roop Nagar, Delhi. He has been a practicing Orthopedist for 50 years. He has done MS - Orthopaedics, MBBS. 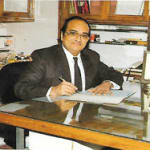 He is currently practising at Saroj Clinic in Roop Nagar, Delhi. Book an appointment online with Dr. N C Gupta and consult privately on Lybrate.com. Lybrate.com has a nexus of the most experienced Orthopedists in India. You will find Orthopedists with more than 36 years of experience on Lybrate.com. You can find Orthopedists online in Delhi and from across India. View the profile of medical specialists and their reviews from other patients to make an informed decision. I found the answers provided by the Dr. N C Gupta to be thorough. Wow...I didn't expect such an indepth response. professional and caring and thorough..even feels empathetic. Thank u. I will start acting on your advice immediately. God bless u .
I found the answers provided by the Dr. N C Gupta to be very helpful. Hello sir thanks for your answer. I will definitely follow your instructions and feedback you after taking medicines you recommended me. Have a good day. I found the answers provided by the Dr. N C Gupta to be very helpful, caring, well-reasoned and knowledgeable. Thank you doctor. I have consulted an orthopedic surgeon and have started the physiotherapy. I found the answers provided by the Dr. N C Gupta to be very helpful. Thank u soo much Dr. for help me, This is very helpful for my mom and that small small things u discover is very helpful. Tx again. Dr. N C Gupta provides answers that are knowledgeable, helped me improve my health, very helpful, professional and thorough. Great relative support. Perhaps this answer address immediate pain too. I found the answers provided by the Dr. N C Gupta to be caring. One of the finest, detailed and wise medical advice I have ever received ! Thanks to Dr. N.C. Gupta. Dr. N C Gupta provides answers that are very helpful. Sir i thankful to you for your perception as i query on lybrate. Does my problem related tobad gallbladder?? I found the answers provided by the Dr. N C Gupta to be inspiring, knowledgeable, well-reasoned, caring and thorough. Great suggestions... Thanx a lot doc! I have been prescribed glucosamine tabs for pain in my knee. But yesterday teh specialist advised me to start oral hyal as well 1xod. On reading the internet I find the use of oral hyal and glucosamine is almost the same. Hyal is supposed to be a new drug which was coming as an injection earlier. I want to know whether I can continue to take both oral hyal and glucosamine tabs together. Please advise. I am 58 years old and have been suffering from stiffness in my knees for 3 years. Both the drugs (hyal & glucosamine) are being used empirically. You can use them jointly for a short while. Keep a strict watch on all the body functions. Any deviation must be told to the treating physician. My grandfather is above 70 years old and recently diagnosed with bp and cardiovascular issues after it fall which led to the fracture of the hip bone. Right now he is experiencing extreme sweating and his bp is going up and down every time we check. Can we give him bp tablets eptus and valent again now? Fractures of hip bone is a surgical emergency. Sooner it is operated, better it is. Kindly shift him to a hospital & be managed by a team of medicine for his blood pressure & other medical problems. I am 62 years male, recently discovered a borderline increase in uric acid at 7.00 through pathological tests. My doctor has prescribed febucip 40 od for treating the same. Seeing the adverse side effects of the medicine, I am terrified as to whether taking such a medicine is really required for treating a borderline case like mine - with such significant side effects. I'm not questioning the competence of the prescribing doctor, but seeking a second opinion from you. Patient with uric acid 7.0 mg & no symptoms need no medication. Regular life style, balance diet, no alcohol, no non veg food are the precautions needed to prevent a acute attack. I met with an accident and suffered fracture on my right hand fingers. A surgery was performed on 30th jan’19. On 26th february the wires and fixator was removed. I started with physiotherapy from 4th march’19. I still have lot of stiffness in my fingers. How much time does it take for the fingers to come back in normal position. Regards amit. Recovery depends on the extent of damage done by injury & how well the surgery is done. I would like to examine you before any comments are made. Tomorrow my running event is there I would like take decca durabolin injection for one day, how much dose should I take please suggest me. You should not take injection decadurabolin now & ever, as it is likely to reject you in competitive sports. I was detected with costochondritis a fe weeks back. The doctor had prescribed chymoral forte and nucoxia sp. I have taken it for 2 weeks and have recovered around 98%. Should I stop the medication or continue for some more time. Kindly advise. Thanks. I am taking hifenac-p tablet daily for leg pain due to my varicose veins. I find difficult to walk even. When I stop the tablet my pain increases. Now i’m taking half a tablet every day. Please advise if this is alright .thank you doctor. Varicose vein is a painless condition. Cause for pain must be found out & treated. Elastic leggings help. Exercises for the lower limbs help. Hi, My left leg ankle bone has deep cut 04 days back. Dr. advised to take injection mikacin 500. Will this cure my wound. Does this injection involves any severe side effects, please advise. There is no medicine which has no side effects. We have to look for them & manage them accordingly. The wound on the ankle must be attended by a surgeon. Hello sir, I want to undergo a 25 km/4 hr walk next week. So I was practicing walk from last week. Before two days I had a walk for 8 kms. I did not have pain while walking. But after having a rest for 1 hr, I noticed severe pain in my hip region of right leg. It was in the back side of my hip. While I walk I have to bend to my right side so it was painless. I feel pain while standing straight in my both legs or when I bend my body toward my left leg. While sitting/sleeping, I do not have any pain. And o pain in my lower back. Next week I have to go for 25 kms walk. Please help me what the problem is. And whether can I go for walk by taking diclofenac tablet/spray? 25 km/4 hr walk is a very severe exercise. It will need a lot of practice & stamina. It is not advisable to undertake such a project under cover of medicines. I met with an accident last week and got my knee injured. Xray report is normal and there is no crack in bone. But there are cuts on knee. I am getting dressing changed every alternate day. The doctor has only asked to take combiflam. Is there any other medicine that I should take to recover quickly. I am sure you must be protected against tetanus. You must take multivitamins and antioxidants along with antiinflamatory medicines.